This week we've got the multi-talented actor, writer, producer Cleopatra Coleman. You may know her best from her role as Erica on the beloved 'The Last Man on Earth' with Will Forte. 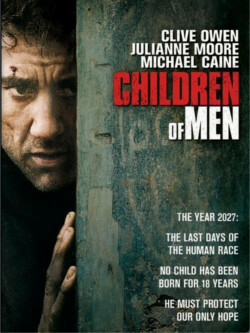 But she's on the show this week to talk about Alfonso Cuarón's masterpiece, Children of Men. Cleopatra discusses the direct influence this film had on her new movie, the apocalyptic thriller that she wrote and produced, Hover. They discuss what the future looks like in both of these films and how the advertising and technology affect the lives of the characters. Cleopatra opens up about writing her first feature and the relationship she had with the film's director. She also reveals that she actually auditioned for a role in Children of Men. Plus, April discusses what went into the famous one take finale shot of the film and how it all went wrong. You can watch Hover in select theaters now. It will be available on VOD on July 3. This week, comedian Ryan Budds joins us in the studio to discuss his experience playing the role of Beach Victim #1 in Sharknado. Spoiler: it involved driving around Tara Reid. Get the inside scoop! Plus, we discuss Charlton Heston's sci-fi classic, Planet of the Apes. The friendly folks at Ask A Ninja were kind enough to invite me on their show this week. The Ninja interviewed me and I performed a sketch - those will air later this week - but the first video was this one. It combines the Ninja murdering me for pledge driving with some audio from our JJGo live show in SF. Matt Gourley from Superego joins Jesse and Jordan to talk about Syfy original movie creatures and more.